From October 8th through the 25th, the Gatlinburg Convention Center will be transformed into a craft mecca during the bi-annual Gatlinburg Craftsman's Fair. 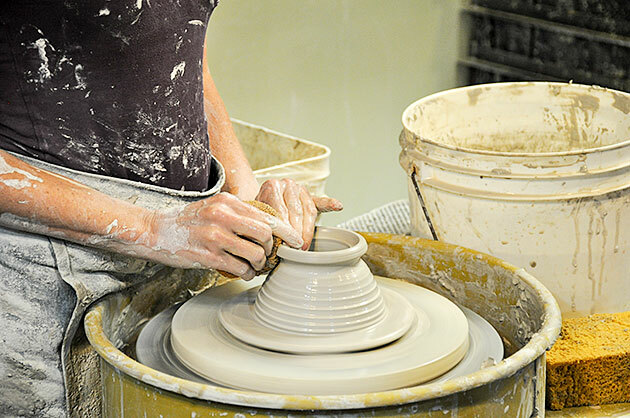 During this highly anticipated event, nearly 200 craftspeople from all over the country will offer their unique creations for sale, answer questions, and give live demonstrations of various techniques. This is a juried show that gets better and better each year, and standards are high for artists. For example, past exhibitor Ben Caldwell is a coppersmith, silversmith, enamellist and sculptor who trained at The Studio School of New York, Harvard University and The Boston Museum of Fine Arts. His incredible metalwork was featured on Oprah's list of Favorite Things and is even used by Martha Stewart in her own kitchen. People come to the Craftsman's Fair from all over the country to shop, buy gifts, learn from other craftspeople and find inspiration. Expect to see truly unusual creations here, including painting, sculpture, ceramics, metalwork, jewelry, textiles, and more. Fritz and Penny Simonecht will return with their unusual leather sculptures and found-object clocks. Also popular are whimsical animal-inspired ceramics by C. Foster's and nature-inspired lighting by blacksmith Steve Joslin. Jeffrey Jobe of Barking Dog Jewelry Design Studio will also return for the fall show with his collection of handmade sterling silver jewelry, unique Bedouin bracelets, and shipwreck chains and pendants. You won't want to miss chatting with this fascinating artist! Because of the sheer number of high-quality artists, the Southeast Tourism Society has recognized this craft show as one of the top 20 events in the southeastern United States. When you get hungry, you'll find delicious small-batch food with regional flair. Take a break with snacks and enjoy free live country and bluegrass music from Dennis Lee and Tim "The Fiddle Man" Watson. Shows are at 12 p.m., 2 p.m. and 4 p.m. daily. There are fun, free activities for kids at the show, and admission is also free for kids under 12. Adult admission is $7. Those who need wheelchairs can borrow one from the Craftsman's Fair office, and if your pet can be carried or has a stroller, they can come too! The Gatlinburg Convention Center is centrally located and within walking distance of all the superb restaurants and attractions of downtown Gatlinburg. If you've had enough walking at the craft show, hop on Gatlinburg Trolleys and let someone else drive you around town. One easy and convenient parking option is to park your car at one of the trolley's 17 lots and ride into the heart of town. October is a wonderful time to visit Gatlinburg. The Great Smoky Mountains are on fire with the colors of turning leaves, and the scenery couldn't be lovelier. Rent a cabin with a view of the mountains, make your holiday gift list (be sure to include something nice for yourself) and enjoy a full day of shopping and learning at the Fall Craftsman's Fair.